Jules Darling: New In: Skincare! Aside from the occasional 'favorite masks' post, I seldom write about skincare. I attribute this to a variety of factors: my own lack of knowledge, the huge variability in what constitutes good skincare from person to person, and the fact that I have never really had what I would consider good skin. My skin wasn't the absolute worst as a teen, but it was far from great. And as my 20s marched on and I inched closer and closer to 30, I thought I was doomed to suffer from breakouts and the occasional cystic spot for eternity. Fortunately, however, over the past 1.5 years or so I have discovered some absolutely stellar products and (with a lot of help from Caroline Hirons's blog) a good routine that keeps my skin pretty clear. I'm still working on refining the texture of my skin, which is exceptionally clog-prone, and now I'm also segueing into increasing amounts of anti-aging/age prevention skincare. At some point I will try to do a more comprehensive post on my skincare, but for now I would say that the two main things that have made a significant difference for me are 1) oil cleansing and 2) using acids like it is my job! If a product contains AHAs or BHAs, basically I want it to be on my face. I have incredibly un-sensitive skin, so I'm able to tolerate harsher treatments than many. I also need to help my skin exfoliate itself so that it doesn't get all clogged. Thus, many of my all time favorite products contain great chemical exfoliants, including these two, which are fairly new-ish to my collection. I used up at least 3 samples of the Sunday Riley Good Genes Treatment prior to purchasing the full bottle (at $105 per bottle, I recommend waiting for a sale at Sephora, Dermstore, or other retailers before you buy as it will save you a good amount of money). Good Genes contains lactic acid, which both plumps AND renews the skin (essentially an anti-aging/exfoliation 2-for-1). Some people find that this tingles on the skin, but I really have only ever noticed a tingle once or twice, on days when my skin was particularly delicate. After cleansing and toning my face in the morning, this is the first thing I slap on. I really think that this product has made the biggest single difference in smoothing out my skin and diminishing any rough texture or bumps that I normally get, especially on my chin and forehead. I don't think I could be without this product ever again. As an aside: I have the Sunday Riley Luna on its way and I literally cannot contain my excitement at trying it out. I hope it is as lovely as everyone says! 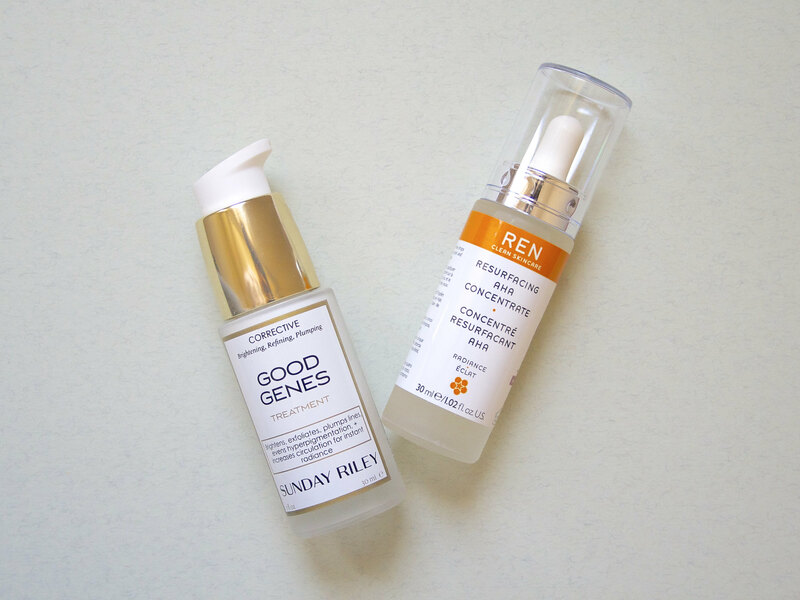 I ordered the REN Resurfacing AHA Concentrate more or less on a whim. I generally love REN products, and appreciate that they are both Cruelty Free and avoid using synthetic ingredients and additives. The Resurfacing AHA Concentrate also uses lactic acid to exfoliate and also claims to reduce pore size and minimize fine lines. So far I have only used this a handful of times as part of my evening routine (under a serum like the Sarah Chapman Overnight Facial), so I can't say whether it has lived up to all of its claims yet. But I have noticed that my skin looks glowy and fresh in the morning when I've worn this, so I have no complaints thus far. The REN Resurfacing AHA Concentrate seems to be a good night time complement to Good Genes, and at $45 it is much less expensive. Available at Sephora, Dermstore, and Beauty.com. Let me know below if you've tried these products or if there are any other skincare products that you would recommend! I'm always on the hunt. And I would love it if you followed me on Bloglovin, Instagram, and Twitter!